Our clear, Silicone Chest Wrinkle Pads – worn while you sleep (because we know you’ve got more important things to do when you’re awake) – are the perfect non-invasive chest wrinkles treatment and work effectively to smooth out your chest, cleavage, decollette and décolletage wrinkles - leaving you feeling and looking younger and full of confidence. Apply to your delicate chest area, and it’ll work while you sleep to relieve and visibly soften wrinkles, so you wake up looking refreshed and ready to start each day with confidence. 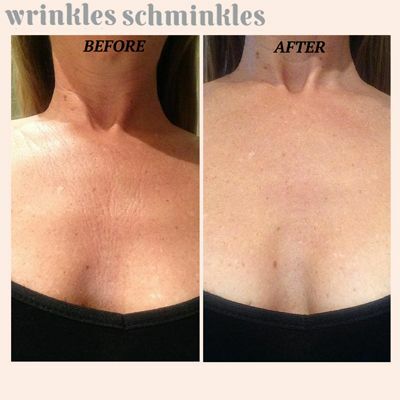 Wrinkles Schminkles Silicone Chest Decollette Pads perform a simple little miracle, every day that they’re a part of your night. Step 1. Applying: Before going to bed, simply wash and dry your skin thoroughly – keeping it free of moisturisers and creams. Peel the plastic film from the Wrinkles Schminkles Silicone Chest Pad and apply to your skin with the self-adhesive side down.